U.S. using chemical weapons in Fallujah? This is copying some links from the American Leftist. And here's a new link: Firebombing Fallujah. "She had some information about the use of illegal weapons by US forces in Fallujah that was very sensitive. A very hot topic. There were rumors of some use of chemicals and a number of weapons that are not legal -- like [napalm] and phosphorus." It returns: Independent, BBC, Christian Science Monitor, discussion (1, 2, 3, 4, 5), commentary (1, 2). The Italians, who have long been looking into this, have footage alleging the use of white phosphorus in Fallujah. NNet seems to be on hiatus, and this is out of my remit anyway (postings on African-Americans and Islam) but since it's of local interest, I'm putting this bookmark here: A struggle for black churches. It's about the demographic changes in Seattle's Central District, which has historically been the center of Seattle's African-American community. 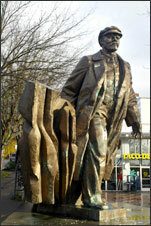 Yes, that's a statue of Lenin, which is located in Fremont, a neighborhood in Seattle. No, we're not that leftist here. Still, the neighborhood of Fremont is, shall we say, a bit on the quirky side and it is known as the People's Republic of Fremont in some quarters. According to the story, the residents of Fremont have decided to drape the Lenin statue with garlands and lights for the holiday season. Even Communists can get into the spirit of the season. By the way, the title of this post comes from a quote that there are 47 states in America, plus the Soviet of Washington (this was back when there were only 48 states). See Communism in Washington State. Washington may be a "blue state" in modern political terminology, but historically it seems that we were a true, deep red. Arise, ye workers, from your slumbers. He is also unusual enough to credit a Guardian article by the military analyst Dan Plesch as his inspiration. "I was just Googling and I found it," he recalls. I wisht them the best of luck in impeaching Blair! Now, if we could just get rid of Bush. I think there's cause. Parachuting dogs, carrier pigeons and glow worms that aided military map reading were among creatures belatedly honoured yesterday in a memorial dedicated to the gallantry of animals in war. Unveiled by the Princess Royal, the bronze sculpture on Park Lane in central London depicts a stallion, a dog and two mules laden with guns. Elephants, camels, monkeys and bears are carved on an encircling wall. ...Yesterday the sculptor David Backhouse told BBC News: "I don't think anyone can fail to be moved by the stories of pigeons that struggled home, of dogs that came through under fire and of the service some of the mules, in particular, gave. Whether you can call an animal a hero I don't know, but they certainly did extraordinary work." These two are interesting when put together Court martial confirms Britain given advance warning of Iraq invasion and MoD ordered Iraq supplies 'in a rush'. More playing politics with soldiers' lives, putting them at risk because of some stupid political game that they play. Arabic forbidden in German mosques? Islamic preachers in Germany have been told they may be ordered to deliver their sermons in German instead of Arabic, in an effort to halt racist diatribes. What next? Ban all speech in a foreign language? A country where certain languages are forbidden in places of worship so that the government can more easily monitor the sermons is not a country where I want to live. I find it unlikely that the threat is so great as to justify this kind of restriction on the freedom of certain citizens. As an African watching the elections with its intransigent electoral patterns among the "red" and "blue" states, voting irregularities, and gerrymandering (the drawing of voting districts by the majority political party rather than by a nonpartisan body) I could not but be amused wondering what American commentators would say if this were an African election: I bet they would bemoan the regionalization of voting as a reflection of Africans incapacity to transcend primordial loyalties based on "tribalism" and "regionalism," voting misdeeds would be ascribed to the propensity of African governments for vote rigging and the ignorance of "illiterate" voters unaccustomed to democracy. The U.S. elections clearly show that the notion of "mature" democracies is a myth; democracy is still a work in progress around the world. "How is it possible that in Spain, after the attacks on trains in which 191 people died, not a single mosque was set on fire?" said Max van der Stoel, a former Dutch foreign minister. "It happened in the Netherlands, which makes you think." Now, that's very much to the point. ...This wall of denial has only increased over time. The soldiers, now elderly, don't want any reminder of youthful crimes and no one wants to link the crimes to the present. Anti-Muslim racism was the foundation of the Dutch empire, not a side effect. They purposely kept the Indonesians as peons and refused to offer them liberation even when it would have served their own interests.